What a beautiful bank holiday weekend we are having. I am taking full advantage of the gorgeous weather and sitting in my garden surrounded by lovely smelling flowers, vines of ripening tomatoes and two chilled out border terriers. Mr Toad has finished cutting the wheat so surprisingly he’s free too, waiting for the beans to ripen. We had a very successful day yesterday attending our first ever farmers market at The Fold, Bransford. Our Toad’s Mill flour was very popular at the market, with many people fascinated how we get from the plant standing in the field, through the dehulling process and then from grain to flour. As promised to those yesterday who bought our flour, it is not only perfect for bread making but also everyday baking too. 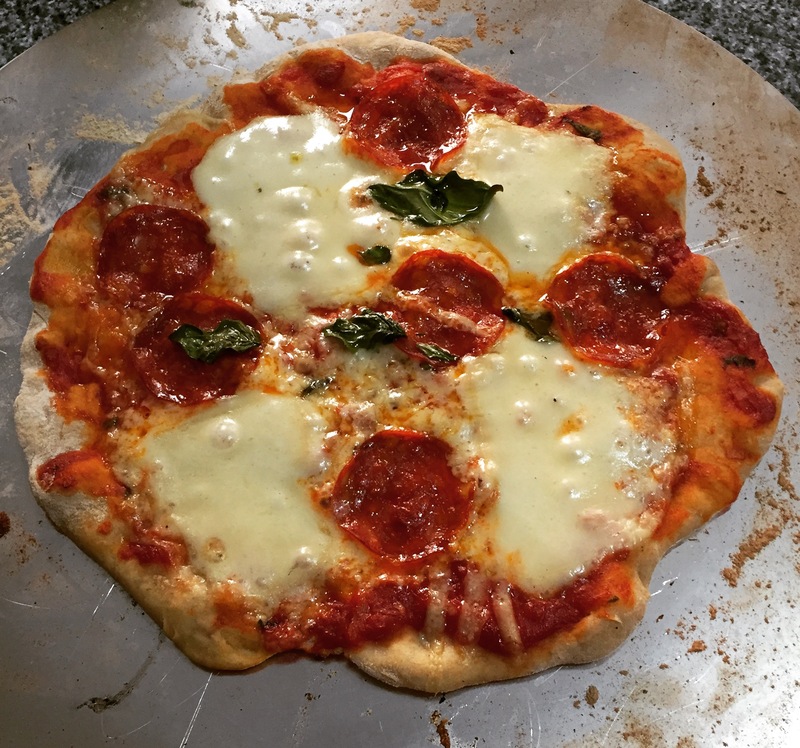 As a wedding present we were fortunate to receive a pizza oven, and ever since have taken great delight in producing various flavours of pizza, but always with the same spelt pizza dough. 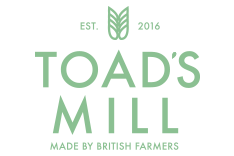 Toad’s Mill spelt flour is a very active flour, rising quickly to produce a wonderfully fluffy and airy base. My Dad has always struggled with eating too late at night, anything after 8pm and he’s up half the night downing bottles of Gaviscon, however feeding him pizzas with spelt flour bases at 10.30pm when they last came up to stay had no ill effects and he slept like a baby all night. After trial and error this recipe seems to work well for us either in a kitchen oven or superbly in a seriously hot pizza oven! Put all the ingredients into a large mixing bowl, with the water in last in a well in the middle. Gently combine of the ingredients together before kneading the dough together on a lightly floured worktop for about ten minutes, until the dough is smooth and stretchy. If you have a Kitchenaid, then combine all the ingredients together, knead for 4-5minutes using the dough hook on setting two. Cover the dough with cling film and leave it to rise for 45 minutes or once it has doubled in size. Cover your hands in flour as the mixture will be very sticky, turn it out onto a floured worksurface and knock out the air and knead once or twice. Divide the dough into four or five equally sized balls, cover with cling film and leave to prove for at least a further 15 minutes. You can leave the dough balls over night once you get to this stage. Work the bases on plenty of flour on the work surface into 12” circles so that they don’t stick. Place pizza base onto baking tray, if using tomato sauce don’t put too much on, maybe 1-2 dessert spoon as you don’t want a soggy bottom, but plenty of cheese and toppings is always a must! Bake until golden brown around the edges, usually 10 minutes in the oven but keep an eye on it, it may surprise you.